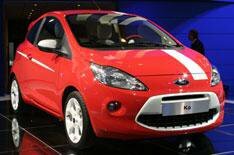 Ford Ka | What Car? The previous-generation Ka has been on sale for 12 years, which is an incredibly long time for any car. British buyers took a third of all sales over this time, and there was actually a 10% increase in the number being bought in the UK in the final year. With many people considering downsizing as the economy bites down hard, Ford is launching the all-new Ka at a perfect time. It goes on sale by the end of the year with prices starting at around 7600. If the snappy design, and the bright colours, arent enough for you, youll also be able to dress Zetec-trimmed Kas up with a range of factory-fitted styling packs called Digital, Grand Prix and Tattoo. Cooool. Youll be able to personalise even further with a range of chrome and colour-coded parts, spoilers and leather interiors. The Ka is based on the Fiat 500, which isnt amazing to drive, but Ford should be able to inject a bit more fun considering the excellent job its done with the latest Fiesta. The ancient engines from the last Ka are ditched, thankfully, and replaced by a 69bhp 1.2-litre petrol and 75bhp 1.3-litre diesel at launch. Beyond that its likely that a racier Sportka engine will emerge, probably using the 135bhp 1.4-litre turbocharged petrol engine thats underneath the bonnet of the 500 Abarth. You can opt for iPod compatibility, and climate control, cruise control and automatic headlights and wipers are also likely to be on the options list. Four trim levels of Studio, Style, Style + and Zetec will be on offer with the latter two likely to have air conditioning fitted as standard.